The eighth Rugby World Cup begins on Friday, with champions New Zealand hoping to retain their title. Eight matches will be held at Cardiff's Millennium Stadium, with Wales in the so-called group of death facing England and Australia as well as Uruguay and Fiji. We take a look at some of the triumphs witnessed by Wales fans since the first tournament in 1987. 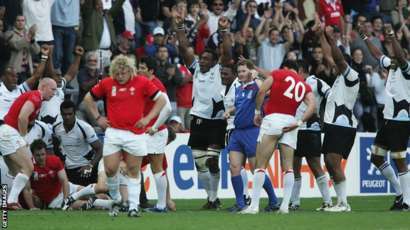 After being smashed 49-6 by eventual winners New Zealand in the semi-final, Wales faced Australia in the third-place play-off. Australia had spent the 1980s evolving into one of the best attacking teams in the world and were strong favourites. Some 34,000 attended the game in New Zealand in the Rotorua Stadium and witnessed a hot-headed opening when Wallaby flanker David Codey was sent off after four minutes for dangerous footwork at a ruck. It looked as though the Wallabies were heading for victory at 21-16, but five minutes into injury time a charge forward by centre John Devereux paved the way for wing Adrian Hadley to cross in the left corner. Remarkably, what seemed a tough kick from the touchline was nailed with little difficulty by full-back Paul Thorburn for a 22-21 victory to seal third place for Wales - still their highest World Cup finish. In the pool stage of 2003, New Zealand were overwhelming favourites, but they were given a huge fright by Wales that no-one saw coming. Expecting to be easily beaten, Wales coach Steve Hansen picked a weakened team to save a number of his first-choice players. Wales wing Shane Williams, who had been selected for the squad as a third-choice scrum-half and had bought his own boots before going to Australia, came into the team and dazzled his way through the first half. Scoring one for himself, two shimmies set up centre Sonny Parker's try and later back-row Colin Charvis dived through a gap in a ruck to score. Wales were leading 37-33 early in the second half but the All Blacks shook themselves off eventually winning 53-37. 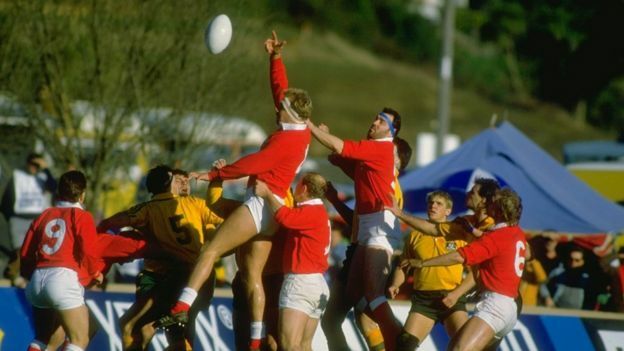 Although the Aussies were expected to win, tries by Paul Moriarty, Hadley and Roberts, and conversions and penalties by Thorburn, all helped seal third place for Wales - 22-21 - their highest World Cup finish. The All Blacks didn't know what hit them when, despite being down 28-10 at one point, Wales made an astonishing combeback to lead 34-28. New Zealand still won by 53-37 though. Wales inflicted a devastating win over Namibia, with Warren Gatland's side 22-0 up at the break and scoring 12 tries overall. 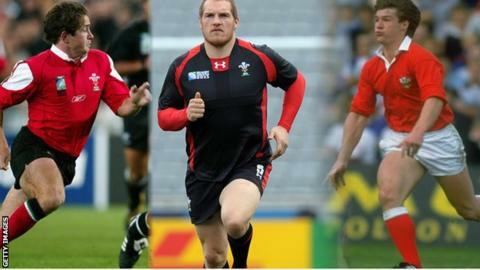 Stephen Jones topped 900 points and, at the age of 19, George North became the youngest World Cup try-scorer. 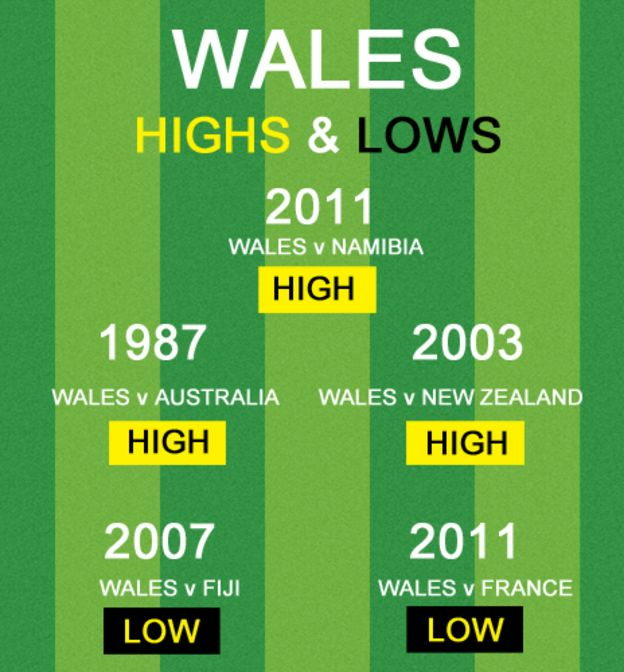 2007 saw Wales suffer their third defeat to a Pacific Island team during the World Cup when they played against Fiji. The 38-34 result brought an end to Gareth Jenkins' time as head coach. In 2011, the semi-final between Wales and France saw Welsh captain Sam Warburton receive a red card for a 'dangerous' tip-tackle on French winger Vincent Clerc. France won 9-8. For people using the BBC Sports app click here to open interactive content on your browser. Ok it's not a Welsh moment of glory but the match was in Cardiff and is one of the greatest sporting events to be held at the Millennium Stadium. New Zealand had been hot favourites to win the trophy, but things started to go wrong for them when the French players stepped up on the New Zealand team whilst they performed the Haka, New Zealand's traditional, intimidating pre-match ritual. Such an act would normally have been rugby suicide but even though the All Blacks dominated at half-time they led by just three points. The game turned in the second-half when utility-back Luke McAlister was sin-binned for obstruction. France sprung into life and monumental flanker Thierry Dusautoir barged through to touch down. Late on in the match, French utility-back Damien Traille fed substitute fly-half Frederic Michalak who sped away from chasing New Zealand players before off-loading to centre Yannick Jauzion who scored to even the score at 18-18. Half-back Jean-Baptiste Elissalde's conversion won the game 20-18 for France. On the night Dusautoir recorded an impressively high tackle count with a tally of 38. As well as scoring a try, he had made more two more tackles than the entire New Zealand team. 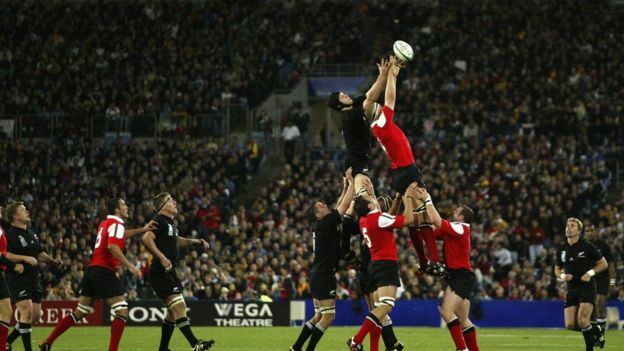 The All Black's defeat meant they failed to reach the semi-final for the first and only time in World Cup history. Wales went into the tournament with a relatively inexperienced team, but in 2011 players such as Rhys Priestland, Taulupe Faletau, George North and Sam Warburton announced themselves to the rugby world. In a pool game against minnows Namibia, Wales ran riot scoring 12 tries. The pick of them was from the prop Gethin Jenkins, who dummied on the 22 and rushed clear before crashing over with three defenders on his back. The distances change with history - reports on the day say Jenkins' run was around 30 yards, today it might be nearer 55. Wales won 81-7 and went on to confirm their quarter final place by beating Fiji, avenging their disappointing 38-34 defeat from the previous World Cup. Wales' World Cup dream ended in the semi-final when they were narrowly beaten 9-8 by France, after captain and flanker Sam Warburton was sent off for a controversial tip-tackle on French wing Vincent Clerc. Again they faced Australia in a third-place play-off, but this time they were defeated 21-18 at Eden Park.